Sam Kirk '05 installs "The Seeds We Plant Today Determine Our Growth for Tomorrow," a mural for WAC's 2017 public art exhibition. Photo: Phil Dembinski '08. CHICAGO (April 25, 2018)–Chicago Sister Cities International (CSCI) and Columbia College Chicago’s Wabash Arts Corridor (WAC) announced today a mural art exchange between Chicago and Casablanca to celebrate the 35th anniversary of Chicago’s partnership with Casablanca, Morocco, which became a sister city in 1982. The mural art exchange is part of an ongoing effort to strengthen the international relationship between the two cities. The Casablanca Committee of CSCI approved the Chicago muralist and Columbia alum Sam Kirk '05–selected by WAC Chief Curator Neysa Page-Lieberman–and Casablanca artist Abedellatif Farhate (“Kalamour”) for the exchange. Kirk will be visiting Casablanca this month to participate in the city’s annual CasaMouja Festival, during which a mouja (wave) of new murals, including hers, will be produced in neighborhoods throughout Casablanca. She is the first woman artist to participate in the event. Kirk will also participate in an art workshop with local students to share her experiences. Kalamour will come to Chicago in September to install a mural as part of Columbia’s WAC. 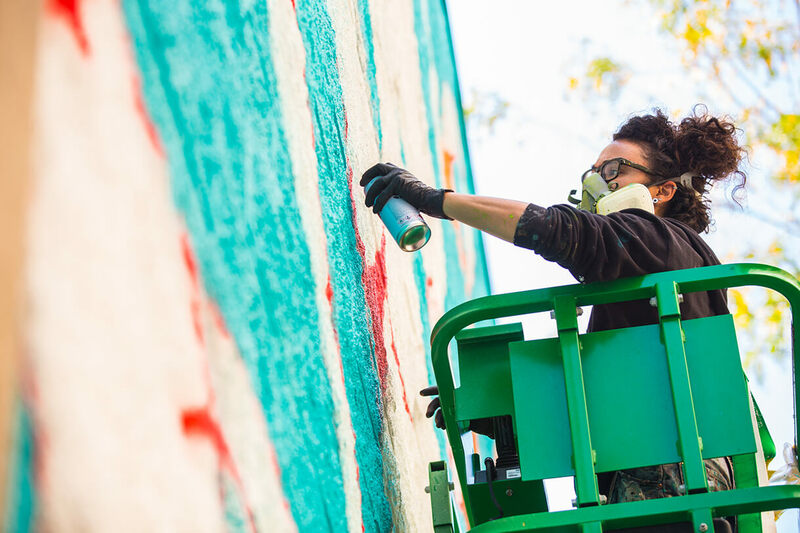 WAC has brought more than 60 large-scale murals, installations, and performances by local and internationally-renowned artists to Chicago’s South Loop, creating one of the most significant collections of public art in the city. In addition to Sam Kirk being the first woman to participate in CasaMouja, Kalamour will be the first artist from North Africa to join the Wabash Arts Corridor. Born and raised on the south side of Chicago, Kirk creates artwork to celebrate people and to inspire pride and recognition for underrepresented communities. Her work explores culture, identity, and the politics that have formed society for generations. Working class communities continue to be Kirk’s key ingredient of inspiration. Partially autobiographical, her vibrant color palette and intricate line-work highlights cultural communities via multi-toned figures and familiar buildings and elements. She has exhibited in galleries and museums, throughout the United States, worked with many private and commercial clients and made custom artworks for non-profit organizations in Chicago and New York. A multidisciplinary artist, Kalamour takes his name from a comic book character he created. Passionate since a young age for drawing, photography, painting and music, he joined Beaux Arts after a bachelor's degree in fine arts. He has exhibited his paintings in Canada in several galleries and in Morocco at the Villa des Arts in Casablanca. His creative process combines portraits, elements of sacred geometry and fantastic figures. Always guided by his instinct, his artistic approach is close to a free expression of the unconscious or the result is always unexpected and unpredictable. Chicago Sister Cities International (CSCI), an initiative of World Business Chicago (WBC), promotes Chicago as a leading global city by developing programs in the areas of cultural arts and tourism, global education, government relations and international business for the benefit of the citizens of the City of Chicago and its sister cities. Learn more at www.chicagosistercities.com. World Business Chicago is a public-private, non-profit partnership that drives inclusive economic growth and job creation, supports business, and promotes Chicago as a leading global city. For more information, visit www.worldbusinesschicago.com. Columbia College Chicago is a private, nonprofit college offering a distinctive curriculum that blends creative and media arts, liberal arts, and business for nearly 7,500 students in more than 100 undergraduate and graduate degree programs. Dedicated to academic excellence and long-term career success, Columbia College Chicago creates a dynamic, challenging, and collaborative space for students who experience the world through a creative lens. For more information, visit colum.edu. A Philosopher and a Psychologist Discuss "The Emotional Mind"